SHAFAQNA – It is narrated from Imam Sadeq (AS) who said: Beware that few continuous deeds based on certainty are better than many deeds that are not based on certainty. And know that no righteousness is better than avoiding deeds which have been declared Haram by God; as well as refraining from bothering the believers and backbiting . 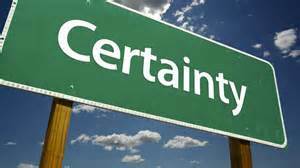 Of course certainty (Yaqeen) has levels, and having certainty in God, is having total confidence and being certain about God’s promises, as well as having absolute certainty about this point that God can hear and see everything at all the times. https://en.shafaqna.com/wp-content/uploads/2018/03/certainty.jpg 168 300 hamrang https://en.shafaqna.com/wp-content/uploads/2018/10/new-logo-s-en-fine.png hamrang2018-03-29 16:16:022018-03-29 16:16:02What is absolute certainty?